Our facilities across North India provide specialized manufacturing services for the Pharmaceutical and Nutraceuticals industry. We are a trusted outsourcing partner to some of the local & global leading healthcare companies. These partnerships are a direct result of a strong foundation of trust, in our ability to deliver quality products, within committed timelines, backed by our established manufacturing and regulatory history. Besides maintaining our facilities as per the updated regulatory guidelines, we also work very closely on environment health and safety, ensuring smooth and continuous supplies to our clients worldwide. 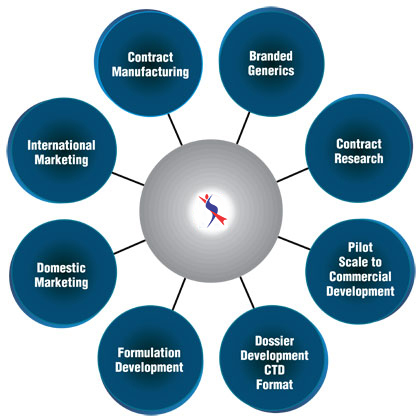 Saphnix Life Sciences a WHO, CGMP compliant company has been a leading provider in contract manufacturing, and formulation development services for its clients over a decade. It holds a credit of sponsoring and conducting 6 clinical trials (Phase IV) and 23 BE studies, whereby ensuring safe and Bio equivalent products to its clients and patients. Till recently our primary focus has been domestic contract manufacturing, and supplies to ROW markets from UNIT II. This has engrained valuable experience and confidence in Team Saphnix Life Sciences, and now with the commercialization of its new unit (UNIT III), which is compliant with USFDA, UKMHRA, PICs etc., it is aggressively seeking expansion in regulated, and semi regulated markets. Saphnix Life Sciences leverages its India cost based advantage, backed by a strong in house R&D and robust marketing to increase its presence in strategic markets where it can demonstrate its expertise.